Our recreation takes multiple round-robin samples of the original hardware sounds, plus four little extras which we found living in the sample memory of the four user pads of the machine we scooped up from a studio sale. (We’re not going to tell you what they are.) It also brings our usual degree of user control to the panning and levels of the kit pieces, and allows velocity to control level if you’d prefer that – much more of a ‘humanising’ effect than the original Casio was capable of! The standout sounds are, to our ears, the kick and snare. They’re tight (because of that limited sampling memory! ), very punchy, and very gritty, the snare especially. They’re brimful of Asha – I mean, attitude, with a crispy crunchy vibe that pushes them right to the front of the mix. There’s also a nice surprise with the ride cymbal sound, which is often a drum machine weak spot, but on the RZ-1 is a neat little ting that works particularly well in busy patterns. You also get three toms (very 80s! ), a crash (a bit short to be useful as a crash, but not bad as a kind of splash or China cymbal), open and closed hats, a cowbell and a rimshot to play with. All in all, there’s enough variety in the sounds to get quite complex rhythms going in short order, and enough punch to make sure the backbeat of those rhythms is right in your face. 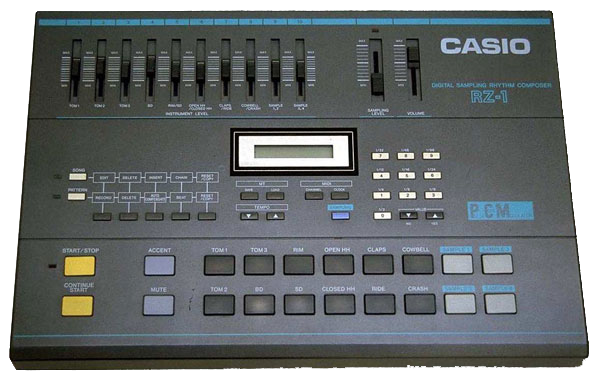 For a big grey slab of 80s sampling, reach for the RZ-1! 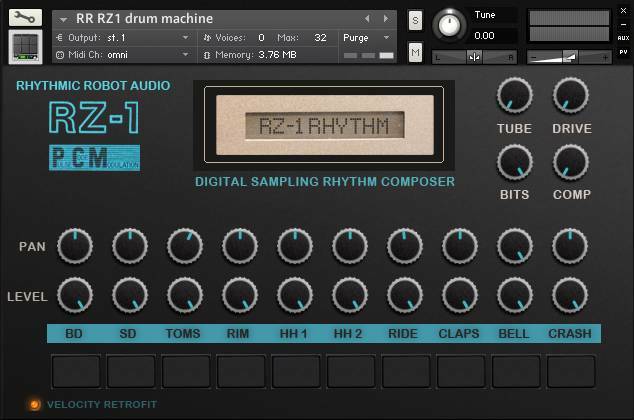 If you grew up listening to pop, hip-hop, or dance music in the 1980s, you’ll be all too familiar with the drum sounds of the RZ1. Now that there seems to be an 80s revival in music and fashion (my wait is finally over!) this drum machine seems relative once again. The high quality of the samples and the built-in effects of this Kontakt unit are truly professional in their sound, and I am extremely pleased with my purchase. This drum machine has grunt – even the lamest beat can turn pretty nasty in its hands. The clean samples are great – real eighties flat charm. But tweak the drive, the bit reduction, tube and compression and it all goes horribly (actually beautifully) wrong. Life in the down-sampled lane! Its the basis for a thousand eighties hip hop tracks – with a great kick and punchy hi hats. Hard to go by when you need the bit reduced eighties sound….